Is It Time To Make A Shift To Help Our Environment? Many of us pay close attention to what we put on our plates because we’ve learned that what we eat can have a big effect on our health. But few of us stop to consider how our food choices impact our environment. In most cases, I think we’re just unaware. Maybe it’s time to educate ourselves about this increasingly important issue. After all, don’t we have a responsibility to our planet, helping feed the hungy and future generations? Researchers at the World Resources Institute have learned that the type and quantity of food people eat has an important impact on the environment and that meat and dairy — especially beef — are particularly harmful. Meat and dairy are in fact considerably more resource-intensive to produce than plant-based foods. They increase pressure on our land, water and climate. Statistics show that more than 66% of total greenhouse gases from food production comes from meat and dairy, even though they only contribute about 37 percent of total protein consumed. Beef production requires 20 times more land and emits 20 times more greenhouse gas emissions per unit of edible protein than common plant-based protein sources such as beans, peas and lentils. 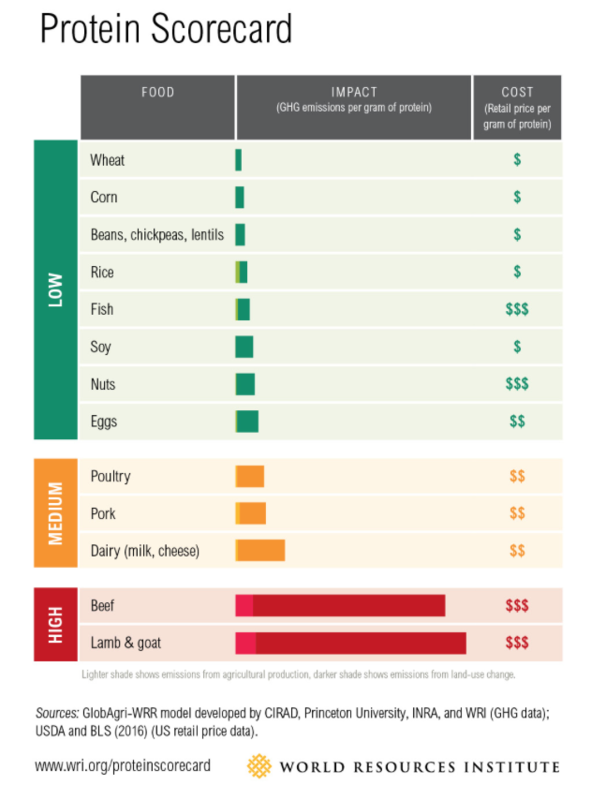 Chicken and pork are more resource-efficient than beef, but still require three times more land and emit three times more greenhouse gas emissions than beans. Surprisingly, more than three-quarters of the world’s agricultural land is used to produce meat and dairy. But what if we make “better” choices? Haven’t we been told that grass-fed, free-range, cage-free and pastured options are a more responsible choice? And isn’t it at least better to buy and eat products that come from small organic farms, which practice more humane methods of production? Well, maybe not. 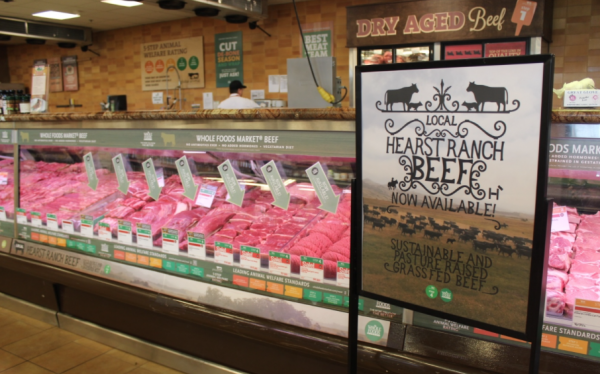 Although these smaller systems appear to be environmentally sustainable, evidence suggests otherwise according to a New York Times article, The Myth of Sustainable Meat. The real truth is that grass-grazing cows emit considerably more methane than grain-fed cows and pastured organic chickens have a 20 percent greater impact on global warming. To make matters worse, demand for animal-based food is expected to rise by 80 percent by 2050, with beef specifically increasing by 95 percent. As nations urbanize and incomes rise, their citizens consume more calories and more animal-based foods such as beef, dairy, pork, chicken, eggs and fish, according to the WRI. Additionally and equally important is the fact that the human population on our planet continues to rise, and is expected to reach 10 billion by 2050. Experts warn that we cannot sustain this growth with our current industrial agricultural paradigm model. According to Dr. Joseph Mercola, natural health expert, the alarming concern is that if we continue along the present path, world hunger will continue to escalate without a viable way to meet the need. Americans eat more meat per person than any other people on earth, and we’re paying the price in doctor bills. At 200 pounds of meat per person per year, our high meat consumption is hurting our national health. Hundreds of clinical studies in the past several decades show that consumption of meat and dairy, especially at the high levels seen in this country, can cause cancer, diabetes, heart disease, and a host of other diseases (meatonomics.com). It’s interesting to note that the global average per person protein consumption exceeded dietary requirements in all regions in 2009, with each person consuming on average about 68 grams per day— one-third higher than the average daily adult requirement. In wealthy countries, protein consumption was higher still. For example, the average American man eats nearly 100 grams of protein per day, almost double the amount of protein he needs. So what can we do to help? It’s not necessary for all of us to go as drastic as becoming vegan! But if each of us made even small dietary shifts towards more plant-based diets we could significantly reduce greenhouse emissions and the use of agricultural resources. According to the WRI, the average American could cut their diet’s environmental footprint in half just by eating less meat and dairy. If we build our meals around plant-based proteins, instead of meat the way most of us were raised, we could make a difference. If you eat beef, just shifting one-third of your beef consumption to other meats like chicken or pork could cut your diet’s environmental impacts by nearly 15 percent. Why not adopt the “Meat-free Monday” policy at your house? Think about cutting your total animal product consumption (all meat, dairy, fish and eggs) by half. If you currently eat meat and cheese at two meals per day, try switching to plant protein like beans, tofu or tempeh at one of your meals. To maintain a healthy weight, add additional plant-based foods to your diet, such as vegetables, oats, quinoa, rice, hummus, nuts and fruits. Use calcium-enriched milk substitutes more often. Any food that comes directly from a plant rather than from livestock will generally be responsible for a much lower level of greenhouse gas emissions than livestock products. ~James McWilliams, historian and writer. You’ll see huge benefits to your health and waistline too! Open the can of coconut milk without shaking it. Spoon 6 tablespoons of the coconut cream from the top of the can into a large skillet. Pour remaining contents of can into a medium bowl, and mix well. In a small bowl, combine vegetable stock, soy sauce and brown sugar. Stir until the sugar is dissolved. Place skillet of coconut cream over medium-high heat until it begins to bubble. Add curry paste and reduce heat to medium-low. Stir constantly until very fragrant, about 3 minutes; adjust heat as needed to prevent burning. Add all the vegetables: onion, red pepper, zucchini, sweet potato, bamboo shoots, green beans and eggplant. Stir until vegetables are hot, 2-3 minutes. 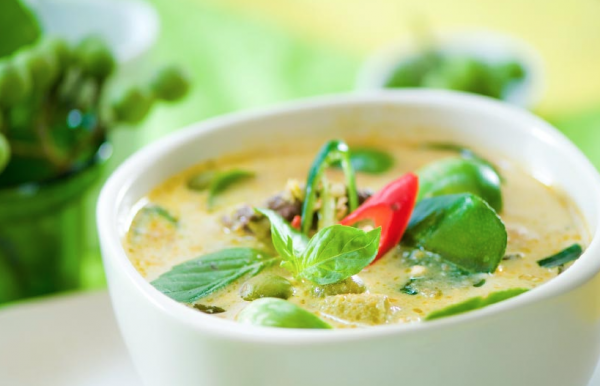 Stir in the rest of the coconut milk, bring the mixture to a boil and reduce heat to low. Simmer, uncovered until the vegetables are tender, about 10 minutes. Add the tamari mixture to the skillet along with a generous squeeze of fresh lime juice to taste; you may use the juice of an entire lime. Stir and mix well. Add up to 1/4 cup water if the curry seems too thick. To serve, place the curry in a warm serving bowl and garnish with the basil chiffonade. If desired, serve over brown or wild rice. Recipe adapted from NYTimes cooking. This One Ancient Spice Has Amazing Health Benefits! A web search for turmeric brings up a multitide of sites, all with a similar headline: Amazing Health Benefits of Turmeric. One site even boasted: 500 Reasons Turmeric May Be The World’s Most Important Herb. We’ve been hearing about turmeric’s anti-inflammatory properties for years so let’s look closer at this ancient herb. 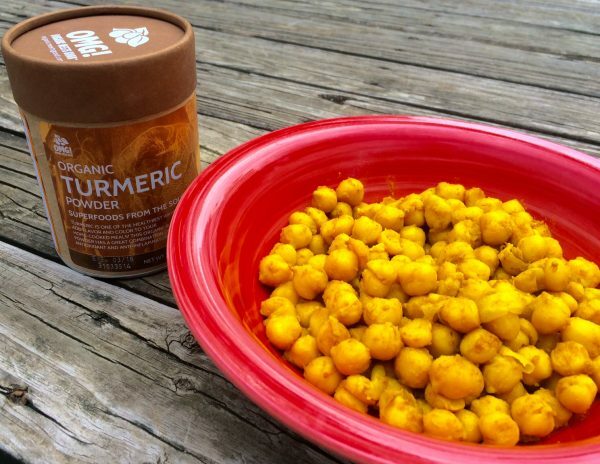 Is turmeric really as great as so many say it is? Turmeric is a spice in the ginger family, native to India and Southeast Asia, where it has been popular in cuisines for several thousand years. It’s an excellent source of both iron and manganese. It is also a good source of vitamin B6, dietary fiber, copper and potassium. The major phytonutrient in turmeric is curcumin. According to World’s Healthiest Foods: Despite its use in cooking for several thousand years, turmeric continues to surprise researchers in terms of its wide-ranging health benefits. While once focused on anti-inflammatory benefits, decreased cancer risk, and support of detoxification, studies on turmeric intake now include its potential for improving cognitive function, blood sugar balance and kidney function, as well as lessening the degree of severity associated with certain forms of arthritis and certain digestive disorders. One author claims that few modern-day pharmaceuticals come even remotely close to turmeric’s track record of safe use in Ayurvedic and Chinese medicine. Many studies suggest equal healing benefits when turmeric is compared to conventional pain relief and anti-inflammatory medicines. If you are currently taking any medications it’s important to check with your doctor before using supplements. Michael Greger, M.D., author of How Not To Die, is convinced we should all be finding ways to include turmeric in our diets. Based on it’s anti-inflammatory properties his recommended daily dose is 1/4 teaspoon daily. Turmeric root has a very interesting taste and aroma. Its flavor is peppery, warm, and bitter while its fragrance is mild yet slightly reminiscent of orange and ginger. An easy way to consume the herb is to simply add 1/4 teaspoon to your green smoothie. I love it on oven baked sweet potatoes combined with cumin, cinnamon and a little salt. It’s also delicious with skillet-cooked garbanzo beans! Note that turmeric’s deep color can easily stain so be careful to wipe up any spills immediately. Despite its vast potential for alleviating human suffering, turmeric will likely never receive the FDA stamp of approval, due to its lack of exclusivity, patentability and therefore profitability. Here’s one recipe I enjoy often. This recipe for Turmeric Chicken is also delicious, but be careful to go a little lighter on the salt. Combine oil and spices in a small bowl and mix well. Place beans in a medium skillet and turn heat to medium high. Pour the spice mixture over the beans and cook, stirring often, until beans are heated through. Remove from heat and let cool. Store in airtight container for a few days. 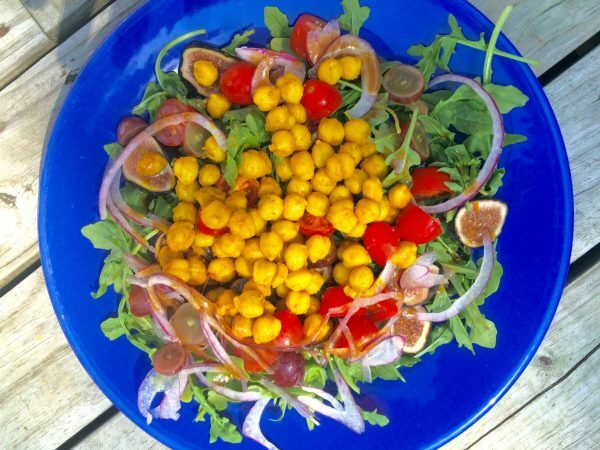 Combine your favorite salad ingredients with the turmeric beans for a tasty lunch. I used arugula, fresh figs, cherry tomatoes, red grapes, thinly sliced red onion and avocado. Top with homemade balsamic vinaigrette and season with sea salt and freshly ground pepper for a sweet and spicy salad. Enjoy! This is a TWC-approved recipe! Let’s face it. The idea of having a big salad for dinner isn’t generally all that exciting. But this one is good…really good! And who doesn’t love peanut sauce? I actually use almond butter and the result is every bit as delicious. 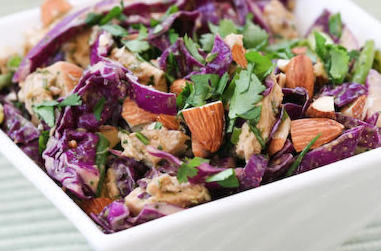 The addition of red cabbage makes the salad more flavorful and nutritious. Red cabbage is loaded with a wealth of phytochemicals, antioxidants, nutrients, vitamins, and minerals. Some of these essential components include folate, calcium, manganese, magnesium, iron, and potassium, as well as vitamin C, A, E, K, dietary fiber, and the B-complex vitamins. Definitely worth a try for the health benefits alone! To make the dressing, in a small bowl whisk together the almond butter, honey, tamari, lime juice and cayenne pepper until smooth. Pound the chicken to 1/2 inch thickness. Season liberally with sea salt and fresh ground pepper. Heat a tablespoon of olive oil in a large skillet over medium-high heat and cook the breasts until golden and cooked through, 4-5 minutes each side. Remove from heat. Slice into thin strips when cool. In a large bowl combine the lettuce and cabbage, carrots, peppers and scallions. Add the chicken, drizzle the dressing over the salad and toss gently to coat. To serve divide the salad onto plates, top with chopped nuts and garnish with lime wedges.